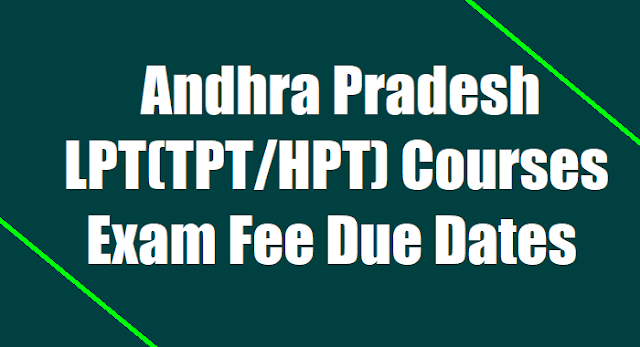 Press/ Media Note: It is here by informed that the following are the due dates for remittance of the examination fee and submission of application forms along with Nominal Rolls in respect of Regular candidates of Language Pandit Course (TPT/HPT) 2016-2017 batch and for the private candidates who have failed in the earlier Examinations. The Date of commencement of Examinations of Language Pandit Course will be notified in due course. The examination fee for Regular and for failed candidates for more than 3 subjects is Rs. 150/-The examination fee up to 3 subjects is Rs. 100/- Examination fee should be paid through the principals concerned only. The principals have to remit the examination fee through consolidated Challans to the following Head of Account. 1. Online submission of applications were introduced in 2013& continued for the same for 2017 also. 2. From this year and onwards online submission of Practical Marks by the Principals have been introduced. 3. So offline system completely dispensed. (candidates may contact their principals concerned for more details).